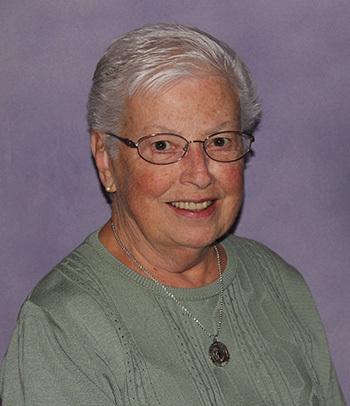 S. Jane Bernadette Leo celebrated 65 years as a Sister of Charity in 2018. When Sister of Charity Jane Bernadette Leo began what would become an extensive ministry at St. Rita School for the Deaf in Evendale, Ohio, she knew no sign language. In fact, she said, “I had never heard of the school before I got my assignment.” But in 1955, she began her new ministry, and has been at the school for 60 of her 65 years as a Sister of Charity. S. Jane Bernadette’s first position at St. Rita was as a first grade teacher. During that time, the classrooms were self-sufficient, with one teacher who taught all the subjects and about a dozen children. Though she didn’t know any sign language initially, she learned as quickly as she could with help from the second grade teacher next door and the students themselves. After about four years, S. Jane Bernadette became proficient enough in sign language that she could teach on her own. The children she taught in the beginning all had various levels of communication capabilities and hearing impairments—some completely deaf, others having some ability to hear. Regardless of the children’s abilities, Sister said she and the other teachers helped them learn. For about a decade, S. Jane Bernadette remained at St. Rita before she was called to a new ministry at St. Charles School in Lima, Ohio, where she taught a class of 50 hearing children for three years. It was a struggle, transitioning from deaf to hearing children, and after a short time, she asked to be transferred back to St. Rita. But in order to continuing teaching deaf children, S. Jane Bernadette needed a master’s degree. 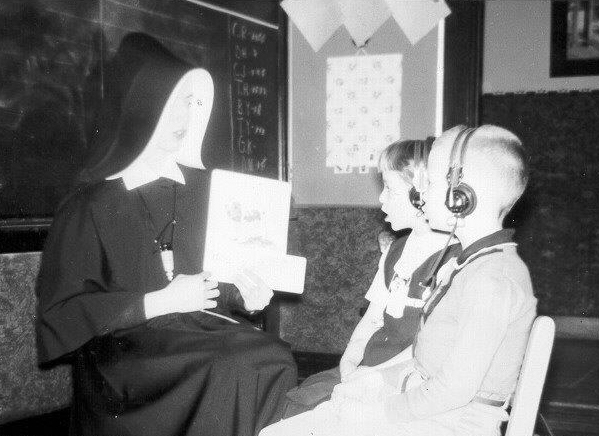 So, she began her graduate education at the University of Cincinnati, where she said, “We were the guinea pig class.” By 1971, she earned her Master of Deaf Education and returned to St. Rita the same year. Jubilarian S. Jane Bernadette Leo has ministered at St. Rita School for the Deaf for 60 of her 65 years as a Sister of Charity. S. Jane Bernadette resumed teaching as an elementary teacher, but shortly after, she began what she says was the most enjoyable part of her ministry at the school becoming a resident advisor. For 20 years, she acted as dorm mother for the young school girls. She said it was a great experience and an opportunity to be a mother, and many parents thanked her for her motherly role within the children’s lives. After the dorms closed, S. Jane Bernadette became a religion teacher, then served at Loft, St. Rita’s daycare center, for several years. The center cared for children ages six weeks to kindergarten age, both deaf and hearing children. “It was precious to see the little kids sign,” she said. In addition to her role as teacher, S. Jane Bernadette assisted with the all-girls Hands of Love choir, which was one of her favorite projects. The group would sign songs for audiences at hotels, parties, and various occasions, and she said, “The people of the community loved them.” To raise money for their performance needs, S. Jane Bernadette said they looked to the community. This often meant collecting aluminum cans to turn in for money, and one local man who owned a bowling alley generously donated all his cans to them. Through their collections, Sister proudly stated that they never had to ask the school for funds and maintained their self-sufficiency all the years she was involved. Though no longer a full-time member of St. Rita, S. Jane Bernadette helps where she can and maintains close ties with the school. St. Rita no longer only ministers to those with hearing impairments. Rather, they have expanded their care to children with apraxia, wheelchairs, autism, etc. The school also offers American Sign Language (ASL) classes in the fall and spring for all who are interested in learning to sign. During her years as a teacher and now as a volunteer helping at events like the ASL seminars, S. Jane Bernadette continuously finds her favorite part of her ministry has been the communication. “The children are appreciative of what you can do for them,” she said, and being able to understand them was so rewarding, as they were so joyful to be understood.